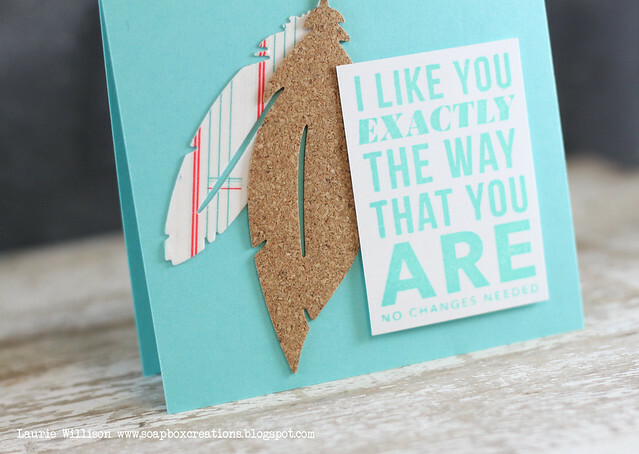 Have you seen all the new Kelly Purkey stuff over at Simon Says Stamp? SO fun. Her new feathers are my new favorite. There are 4 feathers together in one bunch....and they are pretty much awesome. I added some of her new washi to some white cardstock and then cut out one feather. Then I added a larger one in cork. 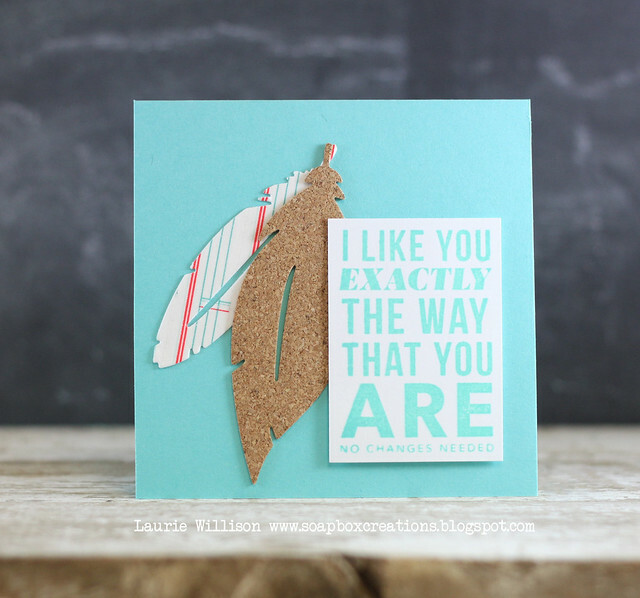 I stamped this sentiment in from her new set called I like you, using Hero Arts Tide Pool ink. I added it to the card base with foam tape. Aren't those feathers so much fun? 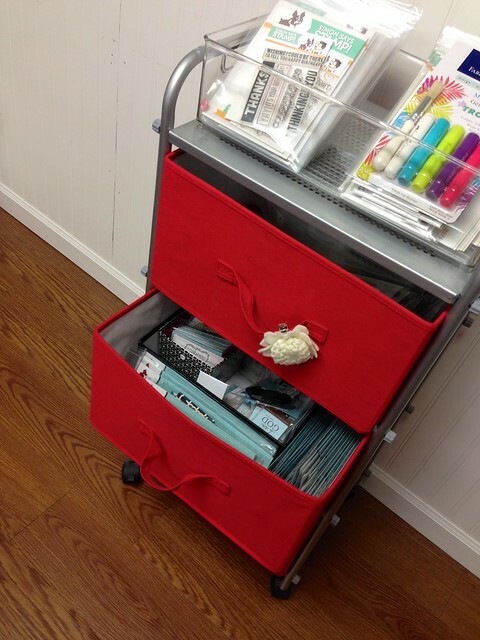 A definite must have for your crafty stash! Hope you are having a great weekend! I am LOVING this fall thing going on. These cool temps make for great nights on the patio. Totally diggin' it! Thanks for coming by today! I used several Simon Says sets here. 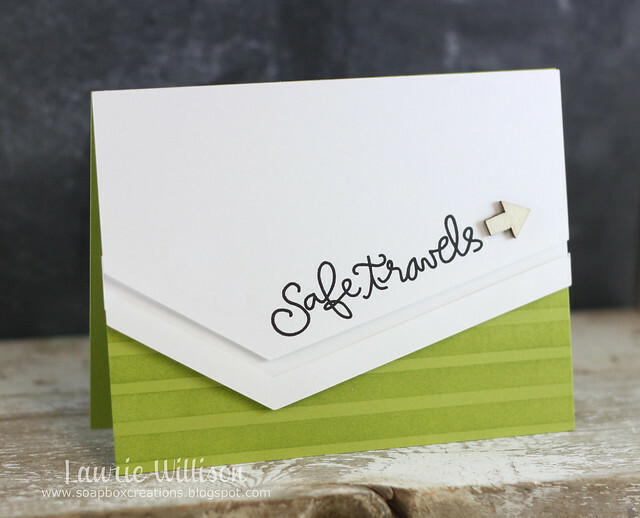 The sentiment is from Life is a Journey and the stripes on the card base are from Nautical Borders. I added in a little wood arrow in too. Stop over to the Retro Sketches blog to see what the other girls have created with this sketch. Link up your creations too! We are partying it up tonight here at my house. It's Chipotle night. We are having several couples over and having a 40th birthday party for my husband. I have a hard time saying that. How in the world can I be married to someone who is 40? How did this happen? OH wait....that means I am almost 40, too. But I am still 20 in my head. (And I am also not 40 yet for several years) :) In all reality, 40 is not old. It's the new 30. At least that is what they tell me! Hehe! Today is our last day of the September 2013 Spotlight Hops! 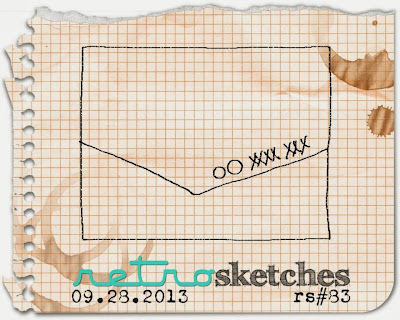 We're so excited to share one more Verve set with you! Everything previewed this week will be available in the Verve online store today! 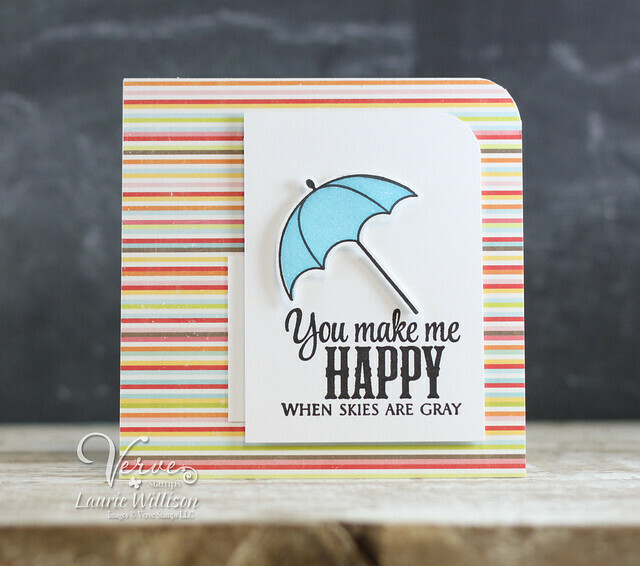 I love LOVE the sentiments in this set and the adorable little umbrellas. Since I am not one to color very often, I am a huge fan of the solid images that come in this set, so the adorable umbrellas can be inked up and used for a quick and simple image. Thanks for coming by this week! I hope you have enjoyed all of this amazing new release. Have a great weekend! So you may remember way back HERE, that I said I wanted some Ikea furniture. Well one year later....it happened. It took lots of saving pennies and some really great convincing speeches to my husband, and he finally agreed to this major overhaul. The reason I say major? Well, the closest Ikea is Denver and our SUV fits us and our luggage....and well, lets just say we were feeling the whole sardine thing on the way home. :) I packed in quite a bit. Luckily, my dad was in Colorado for a wedding so he was able to bring home the table tops for me. 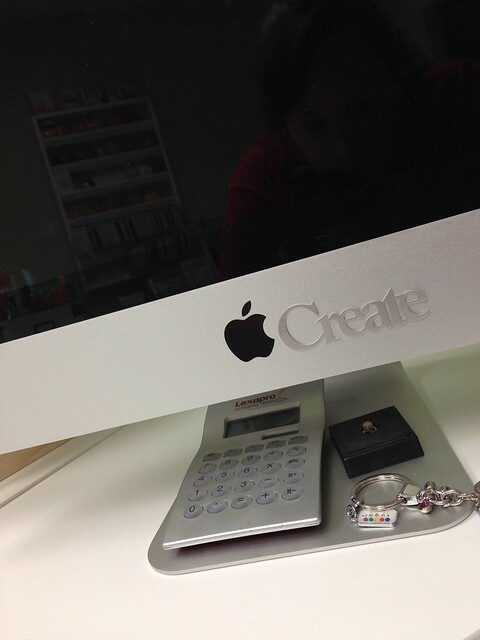 I've had it set up for awhile but it's clean today...which it usually is not. 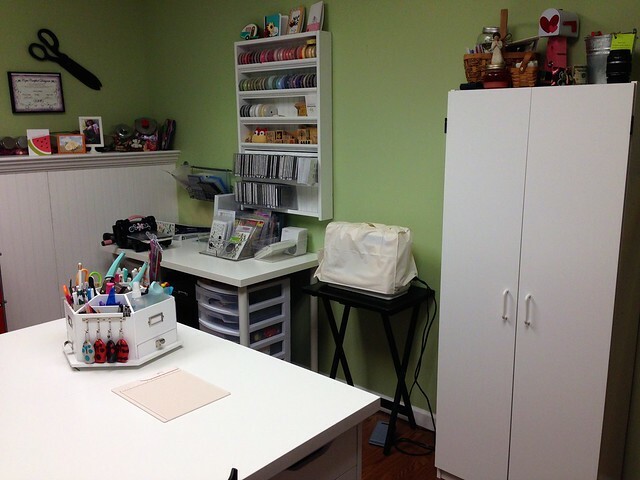 So here are several lots of pictures of the new space. 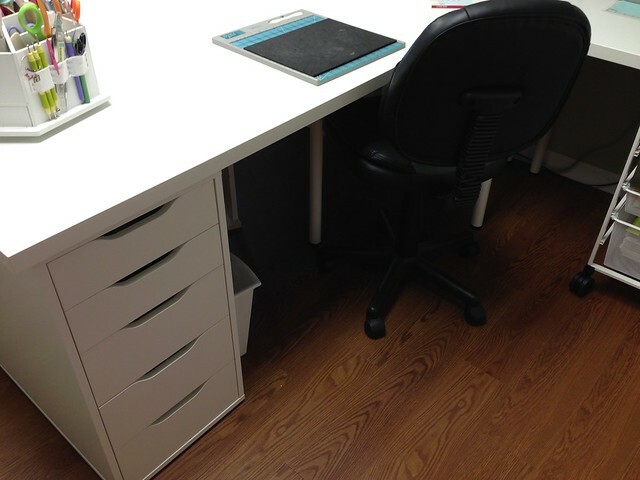 Here is a shot of the new desk space. I was able to grab 2 desks, one for me and one for my little one. It's so fun to have her in there with me! 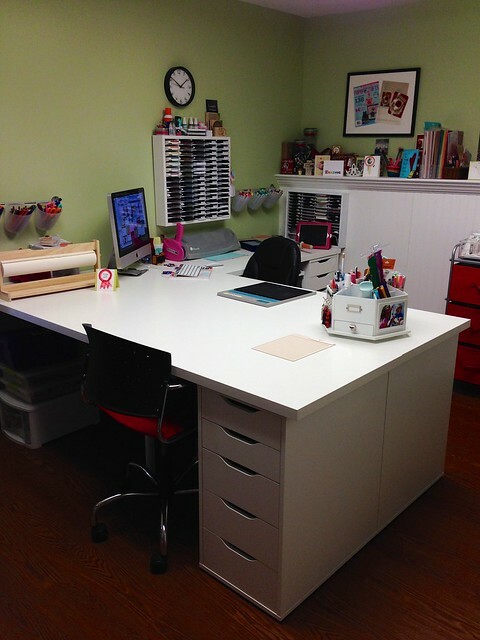 She loves making cards and drawing, so this space is perfect for us! 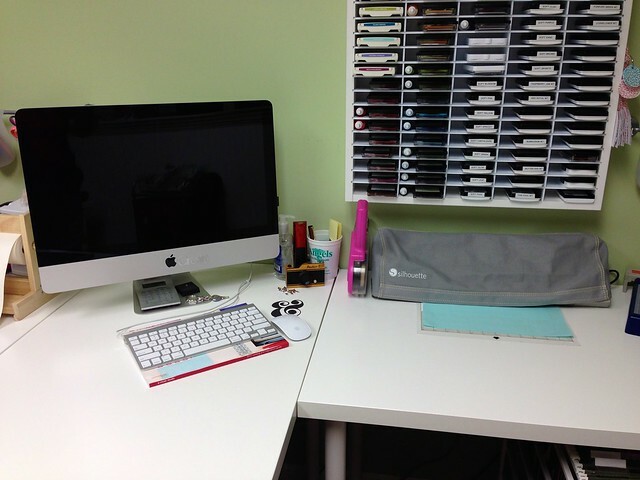 This is my main work area. There are 2 Linnmon's together for our big table, and then I have a small one to the side for my paper cutters and the Cameo. I have 2 alex drawers on the ends of the table tops. Those things are amazing! Here is a close up of how I have my Cameo set up next to my computer. 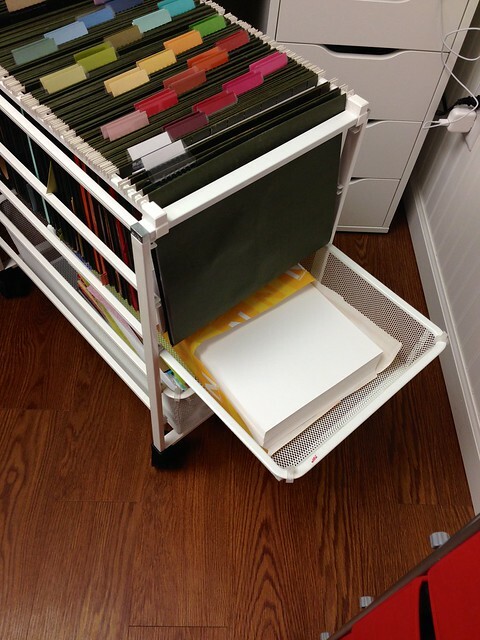 And that handy ink storage too! I bought a the rod and 3 bins while I was at Ikea too. This is now where I keep my Copics. While I was in Boulder, I grabbed this Elfa from the Container Store. I could live in that place. I didn't want to leave. 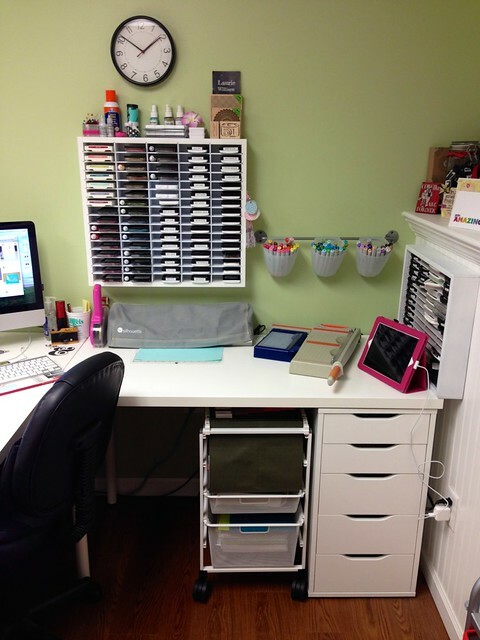 I really think that organizing is a hobby in itself. I have all of my PTI paper in here. There are 2 folders for each. The first is scraps and the second is the full sheet. I need to find some white folders and get rid of these green things. But it works for now and it is so handy to have right under the table. 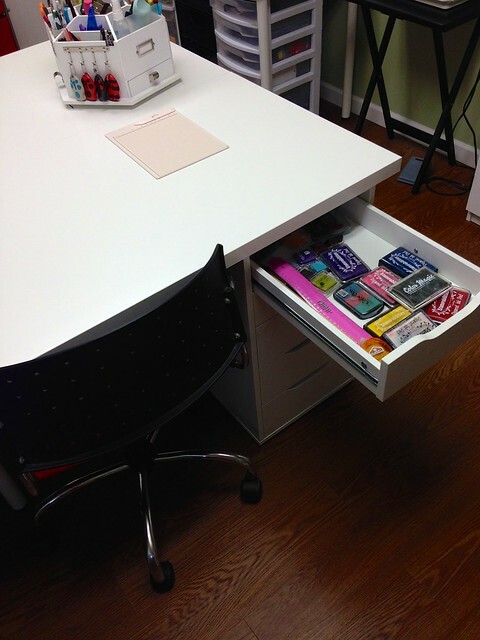 The second drawer down is where I keep my Neenah paper. My new favorite white paper for everything!! 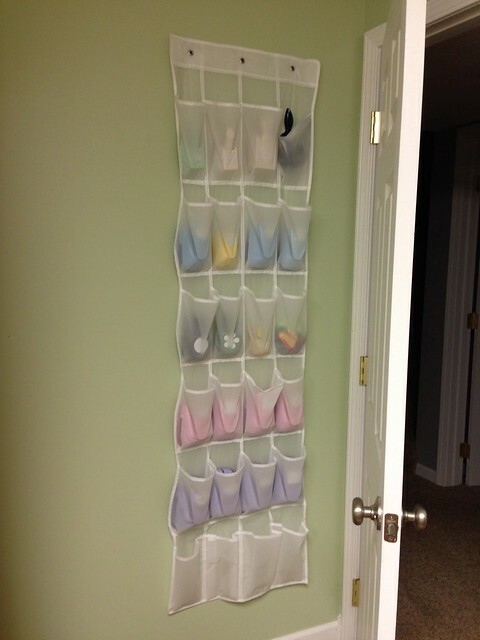 On the other wall I hung up another Ikea rod and basket and then I put my big ribbon and stamp shelf on the wall too. Well....my dad put it there. That thing weighs a ton. 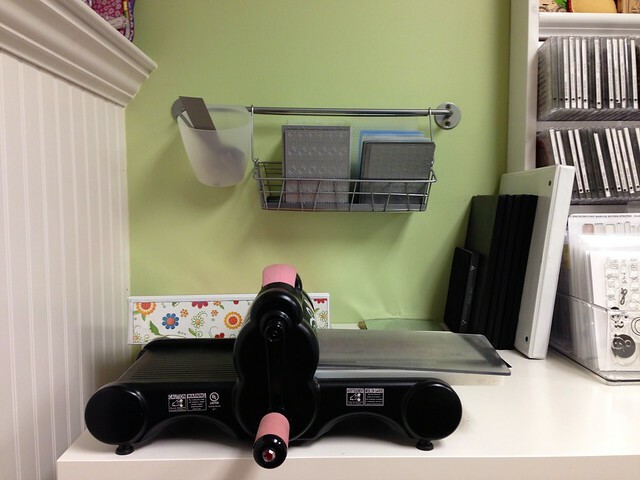 I also have the new Jennifer McGuire stamp storage going on. That is a work in progress but has to be the best way yet! 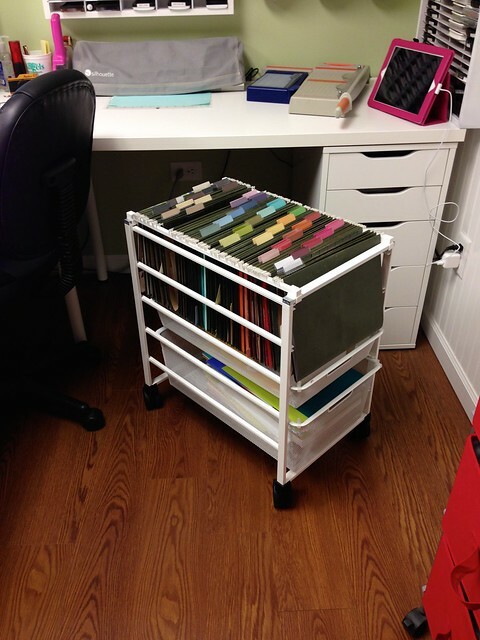 I keep all of my embossing folders and plates in this Ikea wire basket. The little bucket is where I put dies I am done with, if I don't put them away first. It's nice because then they don't get lost in scrap paper piles that usually live on this table. The sewing machine has a permanent plugged in home. I still don't use it that often but I love having it there. 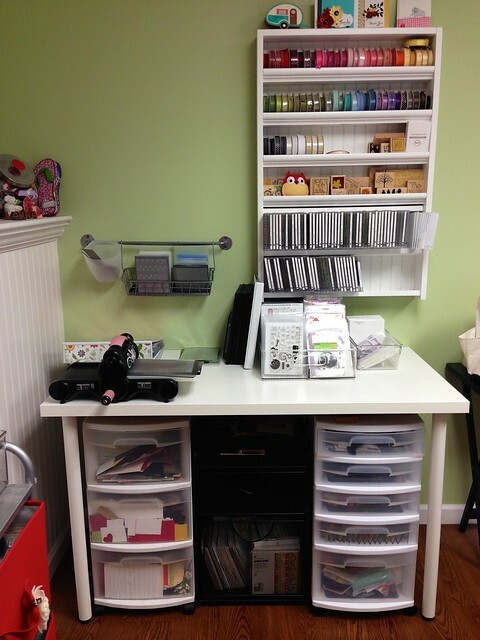 So my little card maker buddy has her own spot too. I grabbed more of those Ikea buckets for her. 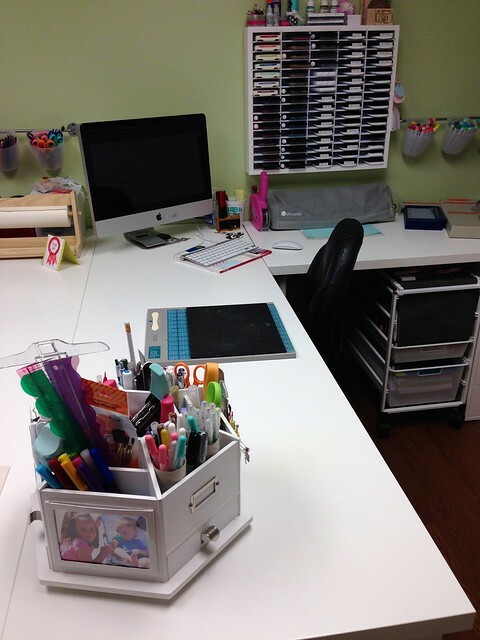 She has a spot just for her decorative scissors, colored pencils and markers. Can you believe those rods were only $2.99 and the buckets are only .99? I need more. 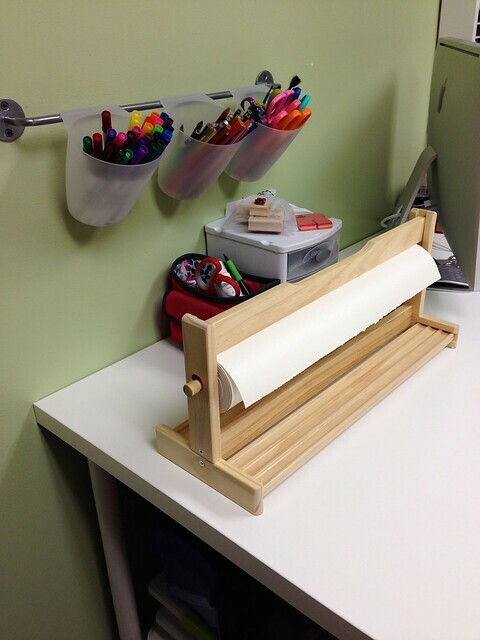 This is also where she keeps her table top easel. This thing is genius. 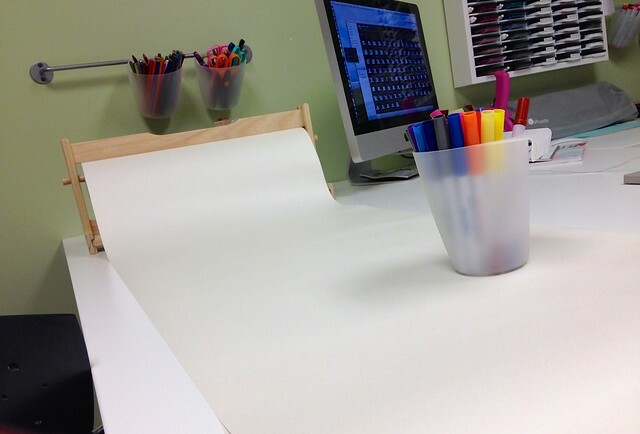 The paper just rolls out and they sit in here with me and draw for hours. Or in the little ones case....10 minutes. I need to get more of that paper next time I go. So handy! And last, I still have all these punches from over the years. For whatever reason, I can't let go of them just yet. The kids use them so that is good. I hid them behind my door in this shoe rack. Thanks for coming to see my space today! Have a great day! Today we are showcasing the Poppy Birthday set. It's one of my favorites from this release for sure! I adore these little blooms! 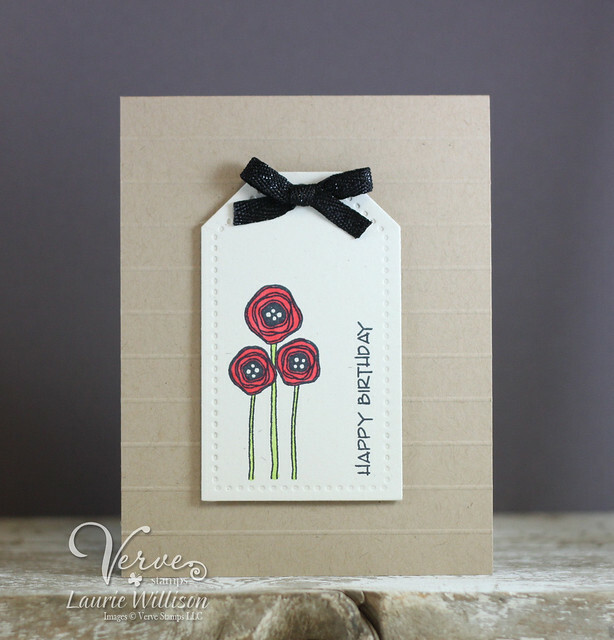 I stamped the poppy's and a sentiment on a tag and then added in some of Verve's black sparkle ribbon. I popped this up on a scored card base to finish it off. One more day of Verve goodness to share tomorrow! Hope to see you then! 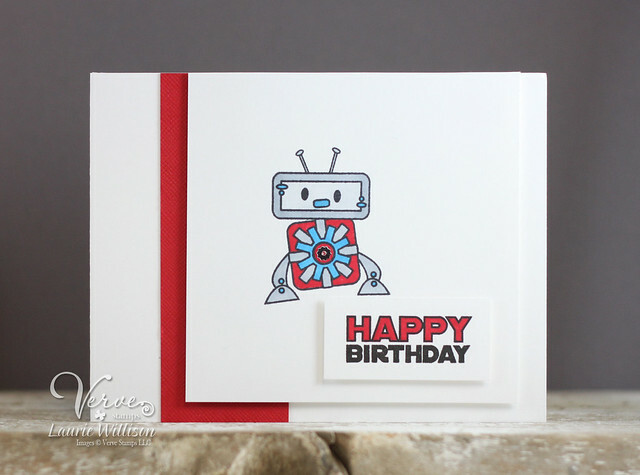 Today we are sharing cards and projects using the new set called Birthday Bots. I have a fun little CAS card using one of the adorable new robots in the set. I thought this one would be perfect for the boys! I simply colored him and the sentiment up with a few Copics and then added in a little cardstock and a metal cog on his middle, from the new Verve Metal Mix. Check out what all these girls have for you today! Hope you are having a great week! Thanks for coming by!